Stockholm may be the capital city of Sweden, but Gothenburg is Sweden’s food capital and was actually voted as such in 2012. Gothenburg, Göteborg in Swedish, recently added to its culinary accolades by gaining two more Michelin stars. Gothenburg already boasted four Michelin-starred restaurants: Bhoga, Restaurang 28+, Sjömagasinet, and Thörnströms Kök. 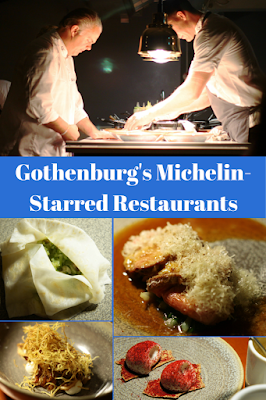 On February 26, 2015, Michelin announced its 2015 stars for Scandinavia and added two more Michelin starred restaurants to Gothenburg’s list: SK Mat & Människor and KOKA. Six Michelin stars is quite an accomplishment for a city with a population around 500,000, but it isn’t a complete surprise because of the great food the region offers. As Gothenburg is a coastal town in West Sweden, high-quality fish and shellfish are plentiful. The area also provides mushrooms, berries, dairy products, and other local and organic ingredients that are showcased in Gothenburg’s restaurants. During our time there we took the opportunity to visit Gothenburg’s two newest Michelin starred restaurants to experience this city’s widely-acclaimed cuisine. SK Mat & Människor is an open floorplan restaurant decorated in simple Scandinavian design that somehow still feels warm and homey with the mixture of dark-colored woods. Diners can easily spy on their meal being prepared in the open kitchen which is center stage. Chef and owner Stefan Karlsson is often present in the restaurant, checking on things in the oven, plating dishes, and chatting with diners. Chef Karlsson also owns two other restaurants nearby and occasionally travels with Volvo to other countries to exhibit Swedish flavors alongside Swedish automobiles. His previous restaurant Fond had a Michelin star and he has prepared the Nobel prize dinner menu many times. SK Mat & Människor, which translates to Food & People, serves dishes with Swedish flavors and local, seasonal ingredients. Serving local ingredients is very important at this restaurant and our waitress Sofie was sure to let us know about the source of many of the ingredients starting with the Göteborg gin in my GBG Persilja, which is distilled just a couple of blocks away, and Rome’s Beerbliotek beer, which was also brewed in town. We had some of the best butter we’ve ever tasted in Sweden, one of which came on SK Mat & Människor’s artistic butter platform. Their butter is handmade and comes from south Sweden. It is creamy and packed with flavor and tastes even better when generously smeared on SK’s homemade breads, especially the dark rye bread with lingonberries. Unlike many Michelin restaurants which only offer a set menu, SK Mat & Människor has an à la carte menu from which it is suggested to pick three items in addition to the four, six, and eight-course set menus. I created my own menu of langoustine with suede, horseradish, and roasted cabbage bullion; local lamb with artichoke, carrots, tarragon, and lamb jus; and dark chocolate crème with a tart sea buckthorn sorbet and a muesli of roasted white chocolate, almonds, and oats. Rome had the four course set menu of Swedish strip loin tartar with brown butter and local mushrooms; brill with roasted cauliflower, salicornia, baked egg yolk, and mussel broth with oysters; pike-perch with salsify, ramson, blackened onions, and oxtail jus; and blueberries with vanilla pudding and lemon ice cream. In continuing with the local ingredients theme, we learned that the mushrooms came from a farm near the Gothenburg airport where they also make their own soy sauce. The mushrooms were cut that morning, meaning their flavor was concentrated and their texture was dense. SK Mat & Människor’s dishes are deceptively uncomplicated, presented more simply than the somewhat fussier presentations of most Michelin restaurants (don’t get me wrong, I enjoy those presentations too). While the dishes are easy to eat, the flavors are not easy to accomplish. KOKA at first glance looks very modern with blond wood covering the floors and walls and permanently fixed tables that can be extended by simply dropping a perfectly sized leaf in between. But look up and you will see vestiges of a historic building in the painted glass tile ceiling trimmed in gold. After being seated we were greeted by our waiter with the question, “Do either of you have any allergies or phobias?,” which I thought was not only a clever question, but also an indication that even though KOKA takes its food seriously, our meal didn’t necessarily have to be serious. KOKA offers three, five, and seven-course set menus. One of Björn Persson’s favorite ingredients is the oyster, so it wasn’t surprising to see oysters make an appearance in the five course menu we chose. After enjoying two initial amuse-bouches, our first course arrived consisting of skrei, a Norwegian cod that is a delicacy and only available a few months of the year, with oyster and celery presented in sheets of celery root. The next course contained what is a very unusual ingredient for Gothenburg, squid served with cabbage and crushed almonds. Next came oyster mushrooms, sour cream, and potatoes with fried shredded potato skins placed on top. The main course consisted of lamb, onion, and finely grated caraway cheese that quickly melted when a broth was poured over the top. Dessert may have been one of the most unusual I have experienced, caramel with a caramel encrusted egg yolk covered in buckwheat. It looked almost like the beginnings of pasta dough, but somehow worked as a sweet dessert. When visiting Sweden’s food capital, visitors will do well to include at least one Michelin starred restaurant into their dining itinerary and taste the best flavors of Gothenburg. To learn more about SK Mat & Människor and KOKA and make reservations, visit their websites at skmat.se and restaurangkoka.se.